London Fashion Week is a wrap for this season, and the excitement has moved on to Milan. The shoes presented on the RTW runways indicate that Spring 2015 will be have London's style set choosing between dainty, chunky and sporty. And then there were the wild ones... those were our favorites. One of these seasons, someone from Shoes N Booze will get to the shows across the Atlantic, but this time, we had to live vicariously through our social media feeds. 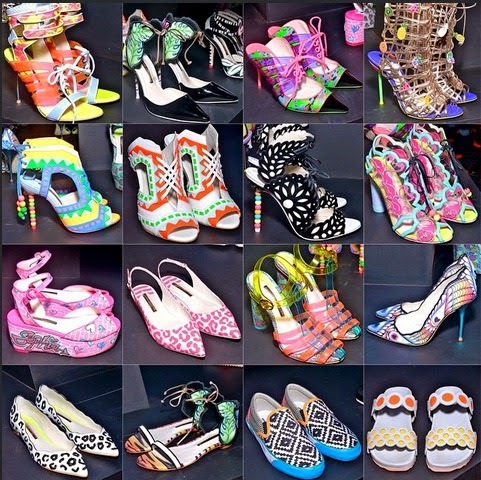 Sophia Webster shoes are our spirit animal. No matter the season, she delights with bright colors, whimsical touches and an ultra-feminine aesthetic. Her SS15 collection, "Jungle is Massive" took a cue from all things untamed— and somehow added a cute factor. We're in absolute awe! Roksanda Ilincic chose brooklyn-based sculptor, Julia Dault's work as her muse for Spring '15. 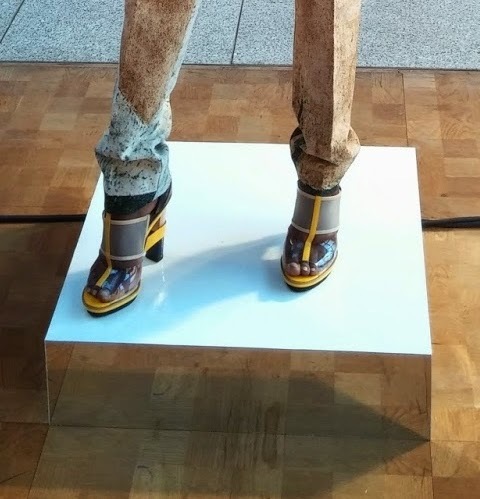 (Every season, she draws inspiration from the work of an artist, so at the end of this show, she informed her audience before anyone had the chance to ask who it was.) Bold colors and geometric details characterized both the clothes and the shoes, which were a collaboration with Nicholas Kirkwood (a Shoes N Booze fave). 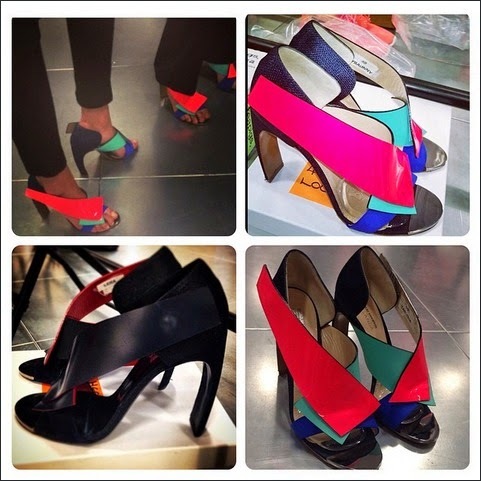 We fell in love with the slightly curved heels and contrasting brights on these sandals. During the 70s, rock groupies were influencers in their own right, and Henry Holland paid homage to them with is Spring 2015 collection. The pieces on his runway evoked words like gogo-glam and flower power. This sandal sums up both concepts in one step with its petal-like back, iridescent trim and tasseled ties. "I create for a complex woman who can only live in chaos"— Toga's designer, Yasuko Furuta. Uh yea, that pretty much sums up the Shoes N Booze crew. No wonder we loved the shoes from her Spring 2015 ready-to-wear collection so much. These architectural sandals with their PLV inserts, multi-level wedge heels and color blocking are just the right amount of crazy. Antonion Berardi found inspiration for Spring '15 in the film The Flowers of War. This translated into dresses, etc. in prints that referenced the refracted light of stained glass windows in a church. The shoes, a collaboration with Rupert Sanderson, were a literal interpretation— at least this pair was, with it's metallic straps and floral appliques. We think they're beautiful. What about you? Did you have any favorites from London Fashion Week that we didn't mention? If they make it to production, maybe we can pair them with a cocktail once the season gets here.